Ebbtide is a unique 7 bedroom, 5 bathrooms historic raised beach cottage circa 1932. From the design to all the details and cottage style touches throughout, guests will feel right at home during their vacation. Ebbtide was lovingly preserved and restored by its owners and offers many original features such as the board and batten wood paneling and wood ceilings to the beautiful hardwood floors. Located just the second house back from the beach on Tybee’s mid-island, you can easily enjoy time at the beach with your family just steps from your front door. The main living areas of the home, along with five bedrooms and three bathrooms, are located on the top floor. The kitchen was beautifully renovated with stainless appliances and granite counters, but still, offers plenty of character. Located off the kitchen are the large open floor plan living and dining area with seating for 8. The living area has ample comfortable seating which makes for a great space for spending time with the family, along with a beautiful brick decorative fireplace with electric firebox and a flat-screen TV. There is also an enormous enclosed and glassed-in covered porch located on the main living level which offers additional space with a Sleeper Sofa. The porch offers two additional sitting areas, a dining table for 6, and another TV. Special Note: The two downstairs bedrooms and baths are accessed through a secure interior entrance and offer central heat and air. Located on the ground level of the home is access to two additional guest bedrooms along with 2 full bathrooms. This ground level also has a laundry room with two sets of washers and dryers. Guests will also enjoy the covered patio area which includes a picnic table, grill area with gas grill, garden view, as well as gliders and swings - another great spot to relax and enjoy the breezes. Parking is available for 4 vehicles. This home is pet-friendly for well-behaved and trained adult dogs. Wireless Internet/WIFI is provided for guest use. This beautiful beach home is owned by New York Times bestselling author Mary Kay Andrews and she is pleased to offer an autographed novel for each stay! Need more space for your upcoming vacation? Then consider also renting a neighboring home. Breeze Inn is a 3 bedroom neighboring home which sleeps up to 10 guests When combined with Ebbtide, there is a combined total of 10 bedrooms, and enough space for up to 26 guests. What a wonderful time of year to spend on Tybee Island and at Ebb Tide. Little traffic and wide open beaches made our visit all the more enjoyable. We were a group of 6 adults with only one couple in the group so we each had our own room with one to spare. The weather was beautiful but was just slightly extreme enough to let us try out both the heat and the AC which worked great. An insider tip, if it matters to you, the ground floor 2 bedrooms (queen, twins) and bath (separate shower and toilet rooms) are on a separate hvac system from the upstairs and it worked out perfectly for my cousin and me as we preferred a cooler setting than our other relatives. We all commented that the good water pressure and quick access to hot water were appreciated. This house has a fully stocked kitchen which gave us the choice to eat in or out. We ate in about half the time with plenty of room to have multiple people helping out in the kitchen and we enjoyed use of the gas grill once as well. Had we needed it, there was room for 10 around the main dining table and even more seating inside and out if you wanted to eat in a smaller grouping. The ample sunporch was a regular hangout as we came back from walks or just hung out to read and chat. We had plans to make use of some of the board games and DVDs but just never seemed to get around to it. Perhaps it was the easy access to the beach and the frequent spontaneous decisions to simply "go for a walk". We were also all on the wifi often, usually chatting at the same time, and never felt like we were overtaxing the transmissions. We parked three cars under the house, one was a van and the other two were small SUVs so everything just fit snugly. There was room for another vehicle on the driveway if needed, especially so for a larger van or SUV. We ventured out for a trolley tour of Savannah and a drive down to St. Simon's Island. Dinners out in town included The Dock, The Crab Shack, AJs and The Stingray. The Stingray and The Crab Shack were probably the two favorites as well as gelato at Jimmy's. . . shopping at Seaside Sisters high on the list as well. All in all, a great week. 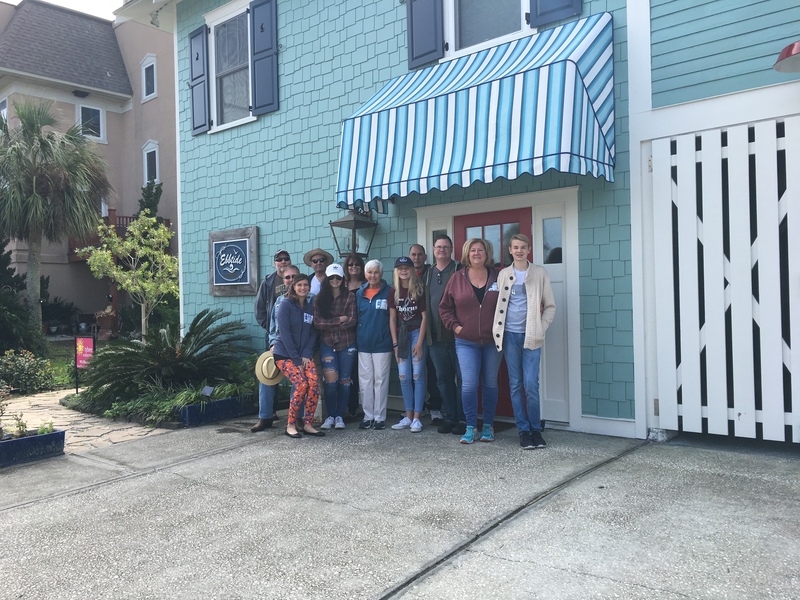 I've been to Tybee before and, in the interest of full disclosure, know the Ebb Tide owners. My cousins did not know them, however, and I know they agree with my assessment. It was their first time at Tybee and they'd very much like to return. All agreed that the house was a highlight and exceeded expectations.